Held monthly the goodies on offer vary from award winning pies from Harvest foods, delicious chutney's and preserves from Humbers and Olney farmer Tony Evans with his locally reared chicken and turkey. Amond them Steve Humber who makes preserves and Caroline Walker from Harvest Foods are pictured right. 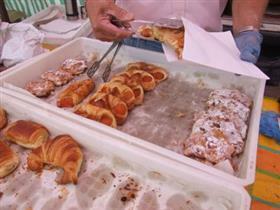 Olney Farmers Market also sells English Wine, cakes and pastries, soaps, pork, lamb and venison. Other stalls sell fish, honey and candles and of course delicious fresh furit and vegetables. The stall-holders all come from the area and sell their own produce. The Olney farmers market is held on the first Sunday of the month - from 9am to 1pm. The average Farmers' Market produce has travelled less than 30 miles from Olney, and may have been picked on the day you buy it. First Sunday of every month from 9 a.m. to 1 p.m.